Why hello there! It has been a while since I have done a proper post. Sorry about that I’m trying to get back into the swing of things blogging wise. 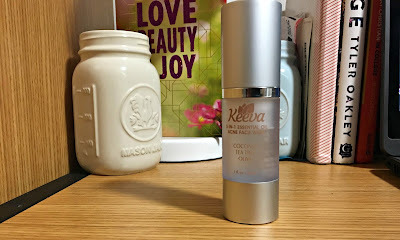 A few weeks ago the company Keeva Organics kindly reached out to me asking to test their product and write a post about it. The product I chose was the 5-in-1 Essential Oil face wash, which was very exciting for me. Whenever I use a new face wash I tend to be nervous because I'm scared of how it would react to my face. Surprisingly I was excited to test out this face wash and I wanted to share with you how it went. This face wash is actually small enough to be in a carry-on luggage and it has a decent amount of product in it. It is a bit bulky so it wouldn’t be able to go in your handbag but it is a nice size to go in your book bag if you have a gym class in the middle of the day and want to freshen your face. With the main ingredients being coconut oil, tea tree and olive it really didn't have a scent to me when I first started using it, but then once I starting noticed it I couldn't place it. When I asked my roommate Liz she only noticed the smell of the coconut. After I sniffed it a couple more times I finally picked up on the scent. I have to say I am very impressed with how light the scent is unlike most face wash that tend to carry a stronger scent. The consistency is thicker than the usual face wash I use which I really enjoyed because it felt so nice on my skin. I found after washing my face I did need to use a little more moisturizer than I usually would. Even though I really enjoyed using the face wash it ended up breaking me out a lot more than it helped my skin. I wouldn't recommend this for someone who has acne prone skin like I do but maybe for someone who doesn't break out as often as I do or for someone who only gets small bumps. I did enjoy this products but sadly I did have to stop using it but I will be shopping there website and testing out more of their products.